Habit: Casearia nitida grows as a shrub to small tree to 6 m in height. The glabrous leaves are arranged alternately, ovate, to 8 cm long and 5 cm wide with a crenulate margin, a retuse leaf apex and leaf base. The incomplete, perfect, actinomorphic flowers are in cymes in leaf axils. The perianth has 5 unfused, green tepals. There are 8 unfused stamens and staminodia. The superior ovary with 1 locule and numerous ovules. The fruit is a round, few seeded, yellow fleshy capsule. Habitat: Casearia nitida grows in Dry Broadleaf Evergreen Formations – Forest/Shrubland (coppice). Distribution in Bahamas/Globally: Casearia nitida occurs throughout the north central Bahamian Archipelago and the Greater Antilles. 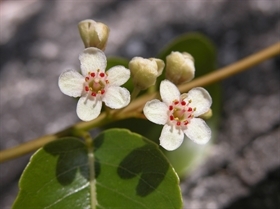 Medicinal/Cultural/Economic Usage: Casearia nitida is not known to be used medicinally in the Bahamian Archipelago.